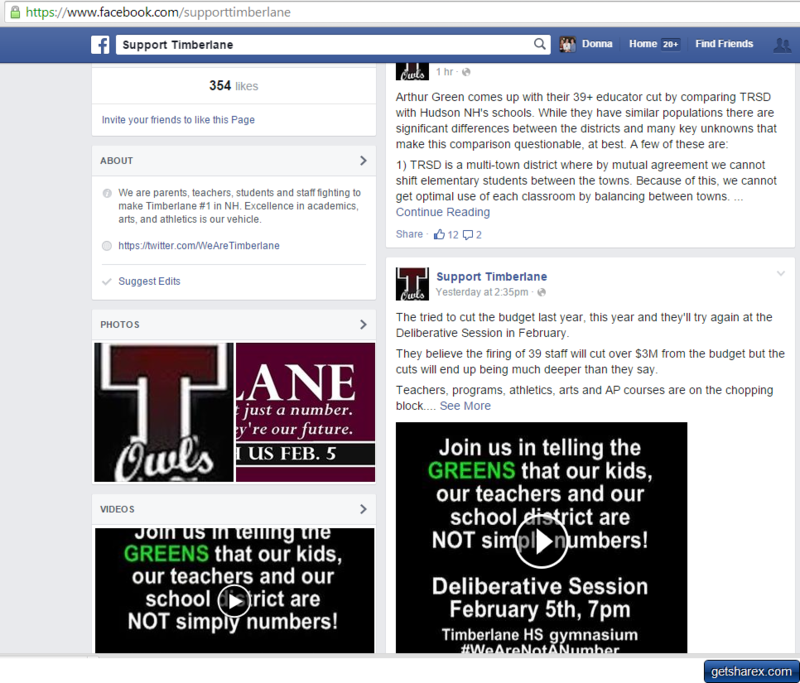 Will the real author of the Facebook page, Support Timberlane, please stand up? I believe it is Gretchen Grosky, the hired PR specialist for Timberlane. If so it would put the district on the slippery edge of electioneering. Most people who rail against the suggestion to lower the operating budget to something affordable for local families have not themselves challenged Arthur Green’s numbers or delved into the expenditures yet they insist cuts would harm the children. Before Dr. Metzler’s budgets, our district ran on $61 million for three years in a row. Now, with fewer students, we need almost $68 million and we have to close a school. Does this sound reasonable? If management implemented cuts with earnestness, education would not be affected but the number of staff certainly would be. So what is this really about? Education or jobs at Timberlane? The plan to consolidate Sandown Central at Sandown North involves the consolidations of one second, third, fourth and fifth grade class. That eliminates four classes and we will still not exceed the recommended maximum number of students per class as per Timberlane policy. This should tell you that when there is a will there is a way to run on less without educational impact. Atkinson Academy has the largest classes in our district’s elementary system yet they and Sandown Central are the highest rated elementary schools in our system according to Niche.com, which Mr. Bealo cites on Facebook. Empirical evidence and academic study have exploded the notion that class size affects educational outcome. Think back into your own education and you will know that classes of 30 plus were the norm in the 60s yet few of us felt short changed by our elementary education. In any event, we are not advocating changing class size limits as set by Timberlane policy and we have shown that even with the staff reductions we recommend, Timberlane will have abundant resources to maintain the existing class size limits. And Mr. Bealo, stop posting comments on Facebook about my personal history. You have no knowledge of me, Arthur Green or our background and please don’t pretend you do. Your facts are wrong and often deprecating. You and I have have one thing in common: we were both censured by the Timberlane school board. Mine was quite public and intended to discredit a dissident voice. Yours was hushed up. Would you like to tell us and your Facebook audience what your censure was about? Support Timberlane, you are right. Our school district is not simply about numbers. It is about giving children the finest education while allowing families to afford their homes. We are at the point where towns want to leave the district because they think they can do it better for less. What has gotten us into this mess is not Arthur and Donna Green, rather it is relentless school budgets that are outstripping our ability to pay. Rob Collins has a sweet, understated persona, but cross him and he’ll cut your figurative head off. He was the major force behind the push of Jason Cipriano from the chairmanship of the SAU board. Mr. Collins’ presence as a substitute school board liaison at a Budget Committee meeting in Dec. 2013 heralded the first censure motion against me. He was again the spur behind the most recent censure in July. The district’s executioner is at it again. Mr. Collins has written to the Sandown Board of Selectmen to ask them to REMOVE Cindy Buco from Timberlane’s Capital Improvement Committee. Ms. Buco is a Sandown Selectman. She recently wrote a stern letter to Superintendent Metzler, urging him to be more responsive and respectful to the elected officials from Sandown. She followed that up with a measured radio interview with Rich Girard out of Manchester. When you read his email to Sandown’s Town Administrator, Lynne Blaisdell, ask yourself, as I do, what authority the co-chair of a committee has in asking for a change to a town’s nomination to that committee – without the vote of the entire committee. I’m on the CIP Committee. There was no vote. There was no meeting. Chairmen are only authorized to run meetings and publish agendas. Good morning Lynne,I hope you had a great Thanksgiving,I’m writing today asking you to forward this unfortunate request to the Board of Selectmen.As you know, the situation between the school district and three of the representatives from Sandown has been very dysfunctional. There are many reasons for this and I’d rather not get into the details of this dysfunction at this time. Rather, I’m writing to you to point out the actions of one of your Board members, Cindy Buco. Last week Ms. Buco took it upon herself to go on a radio show and contribute to the disparaging of our Superintendent, throwing fuel on the fire.Weeks ago we were thrilled to hear that Sandown was sending a Selectman as the nominee to our newly formed CIP Committee. We are setting off in a new direction, taking a task typically performed by the Administration and the Board, and broadening the scope to include community members in an effort to improve and strengthen the relationship between the community and the schools. Dr. Metzler is an integral part of our CIP Committee and therefore all members need to have a functional, working relationship with him, the administraton of the schools and the other members of the committee. Ms. Buco’s actions, whether or not you agree with what she has to say, have seriously impaired these efforts before we have had a single meeting. I’m writing to you today to kindly request that you send a different nominee to the School Board to sit on our CIP Committee. We are trying to take a step in the right direction and I fear that Ms. Buco has already pushed us backward with this interview. You can listen to the interview yourself by selecting the link below. Ms. Buco, in a very public forum, laughs at, agrees with and supports characterizations of Dr. Metzler that are less than kind (i.e. calling him a baby with his diaper on too tight, a brat, immature, etc…). Please let me know how the Board feels about this request ASAP. The School Board’s next meeting is this Thursday 12/4 and we would like to approve all nominees and move forward with the CIP Committee’s tasks. It is really too bad that guillotine is not used for unnecessary expenses instead of people the administration just doesn’t like. How many more insults and bold efforts to stymie the elected representatives of Sandown are the people of this town going to to suffer? If Dr. Metzler and Mr. Collins have a problem working with Ms. Buco, they are free to change their attitude. The representatives of the people of Sandown have to stand up to this. Dr. Metzler has been informed that you are communicating with district staff members to obtain free professional services for personal reasons. It is his understanding this is not the first time you have done so. He directs that any further requests to use district resources in either your capacity as a school board member or taxpayer, needs to be submitted to through the proper channels (School Board chair or the Superintendent). In closing, Dr. Metzler indicates he would be more than happy to help you with any requests that assist you in performing your duties as a school board member. I would not be so sensitive if I did not hear the guillotine being sharpened for the next censure motion. Let me explain the background. The school district’s official minutes are written with Vimeo time stamps which make the video recordings of our meetings part of the official record. I often go back and listen to meetings to check my understanding. I have done this hundreds of times. On Friday I was attempting to view TRSB Vimeo files on the Timberlane.net site and found that the audio did not play. All other videos from Timberlane played as did advertisements on the internet so I knew it was not my computer. I contacted the technology staff member responsible for Vimeo postings, couching the problem as though it could be mine while all the time believing it was on the district’s side. Only about a month ago I reached out to this employee which resulted in him politely and immediately correcting a misfiled Vimeo recording on Timberlane.net. This is the reply that should have come in the first place. It is saying, “Hey, we checked on our end and all is well. Thanks for alerting us but we think the problem is on your end.” And that would have been that. Instead I was sent an insulting email accusing me of using school staff for personal gain. Please note, gentle reader, that at no time did I did violate policy BHC. You should also know that Mr. Green is an IT guy and a good friend is an IT guru so I have no need for free technology service from the district. I was merely drawing attention to a problem. Arthur Green, by the way, figured out the issue. It seems that some of the TRSB vimeos were recorded on only one audio channel. I had changed my computer settings to the right channel only so when a meeting is recorded on the left channel only, I get no audio. Was it my problem? Yes. Was it TRSD’s problem also? Seems likely. My learnings: When I find an error of any kind at the district, write to the superintendent of schools and not the person who can immediately address the issue. The board presented me with a letter of censure tonight. You might think it would contain things I regret, but in fact it has done wonders for my self-esteem. All the excerpts they have taken from my blog and my emails to the board indicate a hard-working person with a flair for clear expression. I stand by every single word attributed to me in that censure letter. The board simply doesn’t like what I said. My reply at the meeting to this censure letter will be posted when it is up on Vimeo. In the meantime, read the letter and figure out, if you can, what they find so heartily objectionable,Letter of Censure Aug 28 or watch the video of the when the censure letter is read, followed by my response. You might also notice that the censure letter did not come on official letterhead nor was it signed by the Chairman. It is nevertheless an official board document and what they handed me at the meeting. And just exactly when did the rest of the board see this voluminous letter so that they could vote in the affirmative?